American Modernism is usually thought of as limited to New York City in the decades following the turn of the 20th century. The towering skyscrapers and heavy machinery dominated iconography of modernization and industrialization. 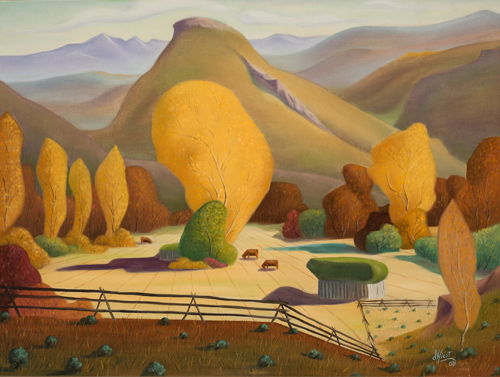 Yet some artists, in their search for an authentic American art, moved west, distancing themselves from the urban life that was quickly becoming the emblem of national identity. These artists chose to reinvestigate the American landscape on their own terms, through the aesthetic qualities of the land itself. They depicted broad expanses of empty space with angular mountains, vivid and bold colors, and intense light that flattened the forms; very different from their predecessors who saw manifest destiny in grandiose and romantic visions of the landscape. 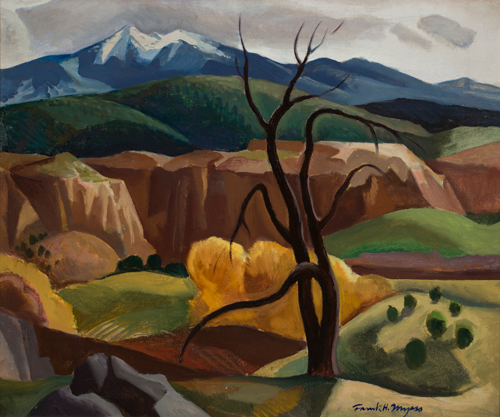 The Modern West presents examples of American artists whose cultural response to modernization existed beyond the skyscrapers of the city, and at the same time broke from traditional modes of landscape painting.